Bottle: Unfiltered Belgian Brown Ale Previously at 8.5% abv. Established 1854. By Felix Verscheure, greatgrandfather of Omer Vander Ghinste, in Kortrijk. Brasserie LeFort became part of the Brewery Omer Vander Ghinste in 1911. 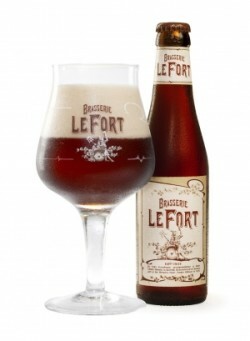 LeFort is a dark, complex ale with an intense taste. Refermented in the bottle. UPDATED: JAN 29, 2019 Bottle. Brown pour with a beige head. Nose of caramel, toffee, spices, toffee. Flavours of raisin, brown sugar, more caramel, brown bread. Very good. UPDATED: JAN 20, 2019 Bottle. Pours a reddish brown with a fading light beige bubbly head. Aroma is of caramel, nuts, bread, grains, brown sugar. Taste is of caramel, subtle spices, clove, chocolate, tobacco, figs. Light oily mouthfeel, medium carbonation. UPDATED: JAN 19, 2019 Brown with a small head. Sweet to the point of being overpowering.Doesn't possess a lot of impact considering its strength. Enjoyed it but a bit too sweet for me-and I have a sweet tooth. UPDATED: DEC 31, 2018 Robe brun foncé, mousse beige. Nez fruit cuit, légèrement citronné. Goût caramel, une pointe de chocolat. Longueur un peu faible. UPDATED: DEC 24, 2018 Bottle from tosano. Dark brown color big effervescent offwhite head. Earthy aroma of toasted grains and brown sugar, hints of coffee and caramel. Ok belgian brown ale. UPDATED: DEC 21, 2018 Bottle from Wijnegemse drankenhal, BBF oct. 2017, kept it in my cellar myself as a strong, dark ale for ageing. Poors milky, dark brown with decent mocha head. Aroma very abundant and clean: somewhat sweetish but nice caramel, dried plums, yeast, vanilla, spicy finish. Impression of an aged Oerbier I dare say. Taste more licorice, candi sugar, slightly metallic, fades away after a while though, again gentle but noticable spicy finish. Taste not of the same fullness as the aroma suggested, the disturbing carbonation doesn't help either. Pleasant yeasty, vanilla, plummy aftertaste. The taste of plums and vanilla lacks a bit of depth and appears rather artificial. This is not a quality quad but definately decent if you take your time of let the carbonation and metallic taste fade away. UPDATED: DEC 6, 2018 Bottle. Pours hazy darkish copper brown with airy light tan head. Clear aroma of malt and yeast, with touches of caramel and fruit. Sweetish flavour of yeast, malt and caramel, with notes of hops, coriander and nuts. Estery aftertaste with notes of spice and caramel. High carbonation, a little too high, actually. Otherwise decent. UPDATED: DEC 6, 2018 Bottle, 9%. Metallic and very caramelly aroma. Clear dark brown colour. Small stable off-white head. The flavour is sweet, caramelly and very spicy. Sort of like vitamin pills, but not as metallic as I had feared. High carbonation. Liquid candy... with alcohol. Beerhouse (Madrid), botella, primera vez. Color tostado-pardo con una corona de espuma que se acaba desvaneciendo. Aroma: alcohol, malta tostada, ciruelas, azúcar, típica belga. Sabor: altamente carbonatada, malta tostada, caramelo, cierto regusto alcohólico nada desagradable. Buena belga.